In an era where the awful melody of toxic nutritional products dominate, Helession –the inspired composer that works outside the system- this year too completed the composition of grape…poems given by the immaculate nature, thus flooding with positive tunes the souls of those who dream of a better world. The making of “honey” from grapes is done within the symphony of ancient traditions and of contemporary technologies, and has “Man’s well-being” as inspiration. We use as “melodies” the natural biological bunches of Roditis Alepou (Fox) that live in the highlands of Mount Kitheron for 50 years now. Well tuned chords of flavors and aromas. With sounds from the flute of Pan. The first listeners were the birds, the cyclamens and the cedars of the vineyard. Dancers with fragrant baskets on their shoulders and feet naked inside the must. Steps that steadily lead to every home. The target is the uplifting of the soul, as it also happens with every significant melodic composition of a poem. Stafylomelo-poem. Untold sweetness! Color of amber. Fine aroma. A taste similar to dried grapes. One sip is indeed enough to fill us with energy. Let us finally turn our back to the chemical products that lessen our quality of life, and let us agree upon nature’s superiority. Helession has produced the absolute natural hyper-food, out of 100% fresh biological grape under the environment’s temperature. The Herbal “Honey”! Without adding sugar, sulfite preservatives, or any other chemical additives. With a plethora of nutritional elements necessary for the health of the human organism. 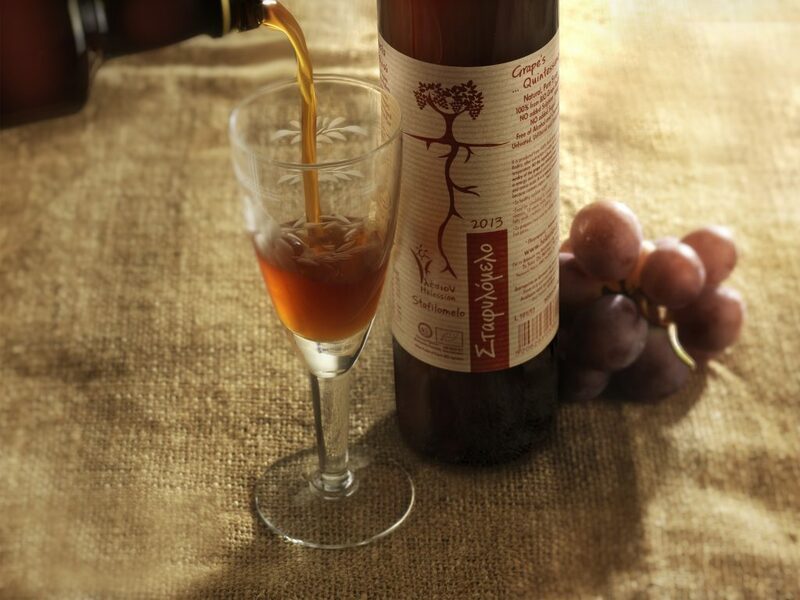 Stafylomelo is natural, unadulterated syrup of fresh biological grape, unfiltered, and with a diploma of patent. • Significant quantity of sugars (glucose and fructose), products of nature and its assimilations from the human organism. Click here to see in more details what Stafylomelo contains. Stafylomelo does not contain sugar, lactose, preservatives, colors, added flavors, cholesterol, gluten, caffeine, alcohols or chemicals! Stafylomelo is not molasses. It has not been boiled, or cut with ash, argil or other chemicals, thus all its beneficial nutrients are alive. • Use it as food for stimulation, and for the better health of our organism. • Ideal food for raw food, vegetarian and vegan diets. • To make a dry wine into semi-sweet or sweet wine! • To produce fresh natural grape juice by mixing five parts of water to one part of Stafylomelo! • To garnish creams, ice creams, to enrich the taste of salads, roast meat, as well as sea food. • To enjoy as aperitif, and during summer time we can add crushed ice. • To enrich the flavor and the nutrients of juices from other fruits. • To naturally increase the strength of the wine, by adding Stafylomelo into the must. • To produce wine all year round! By adding four parts of water to one part of Stafylomelo, we get ready must that starts fermenting! The possibilities of Stafylomelo naturally expand in pastry making, where this valuable product of the vineyard can replace either sugar or honey. If we want to neutralize its acidity, we can boil it with ash or lime, thus creating the famous molasses. The natural organic acids and the probiotics accelerate digestion of food in the stomach and help in the general the human digestive system (they severe lactose, gluten, they chelate trace elements etc). The polyphenols of the grape naturally help the human health system. They have anticancer, anti-oxidizing, cardio-protective, anti-allergic, anti-inflammatory and anti-aging properties. They present important anticancer action by eliminating the danger of inflammation and the mutations of the DNA (1). The anti-oxidizing power of the polyphenols found in the grape is 20 times more powerful than Vitamin C, and 50 times more powerful than Vitamin E. Polyphenols are distributed in every organ and tissue, and remain in the body for 72 hours. They neutralize free radicals, they protect and reborn Vitamins C and E.
• Platelet adhesion, thus contributing to the reduction of atherosclerosis and coronary disease. The phenols and polyphenols of the grape have powerful anti-aging action, they protect the collagen and the elastin of tissues, thus helping preserve the skin’s youth and glow. They help at preventing neurological dysfunctions, like Alzheimer and Parkinson disease. The phenols and polyphenols of the grape help reduce the levels of glucose and bad cholesterol (LDL) in the blood. The natural organic acids -tartaric and malic acid- are exceptionally effective chelate factors that help at the better absorption of the natural trace elements of food. The tartaric acid is a natural organic acid, one of the most widespread fruit acids and we mainly find it in the grapes. It chelates the free trace elements thus contributing in the better absorption of food ingredients from the human organism, and at the same time it inactivates ions of heavy metals that are hazardous when they are free inside the organism (2). The tartaric acid that remains is not metabolized by the human organism and is removed from the human body through urine with natural procedures and without side effects. The malic acid is a natural organic acid found in the grape juice and in many other fruits and vegetables. Malic acid has the property of helping the body produce energy, even in conditions of oxygen shortage. It is present in all living cells, and it is necessary for the transformation of sugars and fat into a source of energy for a healthy muscular function. Moreover, it acts as a catalyst for the Kerbs cycle (3). Even though malic acid acts as an acid in the stomach, it has an alkaline effect in the blood, thus improving the PH. The acidity in the blood is connected to many inflammatory diseases, such as arthritis. Malic acid is greatly effective in the detoxification of the human organism from heavy metals and as a result it helps those who suffer from Alzheimer, Parkinson (4) etc. The probiotic microorganisms refer to a big group of microorganisms that are beneficial to the human body and are widely spread in nature; they are also found in the human digestive system. These microorganisms survive during their stay and during their passage from the gastrointestinal tract, since they are not affected by the acidic environment of the stomach and the bile. They ameliorate the natural intestinal flora by preventing the development of pathogenic bacteria, and by favoring the development of microorganisms that are beneficial to humans. Moreover, they decrease the PH of the intestine and participate in the disintegration of food, thus producing many nutritional elements beneficial to humans (polyphenols, amino acids, vitamins etc). • They either relieve or prevent stomach disorders, such as gastritis and ulcer. • They help at either the restoration or the improvement of the natural intestinal flora at an everyday basis and even after we have taken antibiotics. • They help in many other digestive problems, such as the syndrome of the irritable intestine, the inflammatory diseases of the intestine, the intolerance in lactose and gluten, the celiac disease, etc. • They even help preventing and curing gynecological problems (fungal infections, vaginitis, cervicitis, cystitis). • They enhance the peristaltic movement of the intestine. • They help stop the mutagenicity of the intestine’s content, thus decreasing the intestinal tumors. • Once inside the mouth, they fight against streptococcus mutants that are responsible for the creation of dental decay, periodontitis, and more. • They restore the natural micro flora of the skin. • They can also sooth the symptoms of stress disorders and depression (5). 1. The impact of the grape’s polyphenols is in the action of the enzyme of topoisomerase I, which presents increased action in cancer cells. Its halting is considered an indication of chemo-protection/anti-cancer action. Findings of many researches showed that the vegetable polyphenols of the grape suspended the action of topoisomerase I. The suspension of this enzyme is one of the mechanisms responsible for the anti-cancer action of grape extracts that has been studied in many researches. (Source: “STUDY OF BIOLOGICAL PROPERTIES IN EXTRACTS AND VEGETABLE POLYPHENOLS FROM GREEK VARIETIES OF VINEYARD (VITIS VINIFERA)” University of Thessalia). 2. Another ingredient of the grape that also binds free metals, thus forming steady anionic complexes, which are steady in neutral even in alkaline solutions, is tartaric acid. In the presence of many tartaric anions, we can avoid the hydrolysis of metal cations, such as Sn(II), Sn(IV), Bi(III), Fe(III). (Source: Dimitra Spanou, Chemist, http://dimitra-spanoy.webnode.gr). 3. Malic acid supports the production of energy that the body needs, and it is the producer of energy in the mitochondria (ATP). Moreover, it is the medium of a cycle for the metabolism of sugars within living organisms. This cycle is of great importance (cycle of Krebs), and it is part of a process during which living organisms turn food into energy. It is also the only ingredient that participates in this process that has been connected beyond doubt with the natural activity and the production of energy in the human body. The physical strength of humans is directly connected to the significant increase of enzymes that cause the metabolism of malic acid, resulting in today’s circulation of many dietary supplements that are based on this acid. (Source: Malic acid Wikipedia). 4. It has been proven that those who suffer from Alzheimer and Parkinson diseases have high concentrations of aluminum in the brain. Malic acid constitutes a powerful detoxification of aluminum in the body, and also contributes to the removal of heavy metals from the organism. 5. What do new studies show about these?Studies show that they can be used for the treatment of allergic rhinitis and allergic eczema. They also show that when consumed by pregnant or breast feeding women, they can avert the manifestation of allergic disorders of their children, because they increase the concentration of immune factors –such as cytokines- in the mother’s milk. It is also likely that they protect from the resistant staphylococcus- a germ that constitutes the primary cause of serious inpatient infections.Some probiotics have also been related to weight loss and to the regulation of body weight, because they prohibit the action of an enzyme (called pancreatic lipase), and they restore the flora of the intestine, which plays an important role in the formation of obesity. (Source: www.iatronet.gr).The assimilation of iron, which forms insoluble hydroxide in neutral pH, receives help from many bacteria and fungi from the derivatives of iron carriers that chelate iron and help its transportation to the insoluble complex. (Source: http://e-class.teilar.gr/.../MICROBIOLOGY NOTES).